Red Pill: Shiny New Toy’s Blog » Twitter Cha-cha-cha-changes! 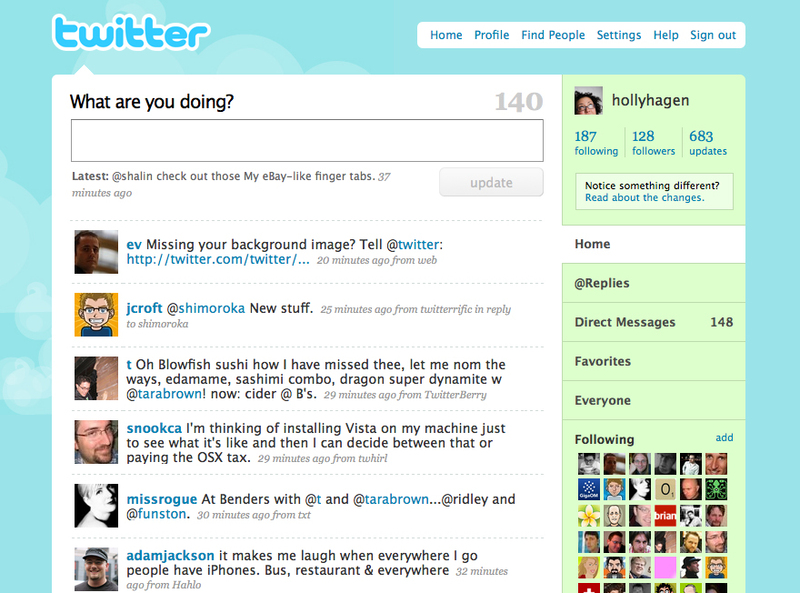 Twitter got a little face lift yesterday and its not that bad. I love the look of the larger type for your “following”, “followers”, “updates” count and that your latest tweet is place under the update field. They do use a lot of my design pet peeves… but that’s pretty much the extent of my complaints. Pet peeve #2: Finger tabs… or at least that’s what I’ve been calling them since my boy Shalin added them to the redesigned My eBay. 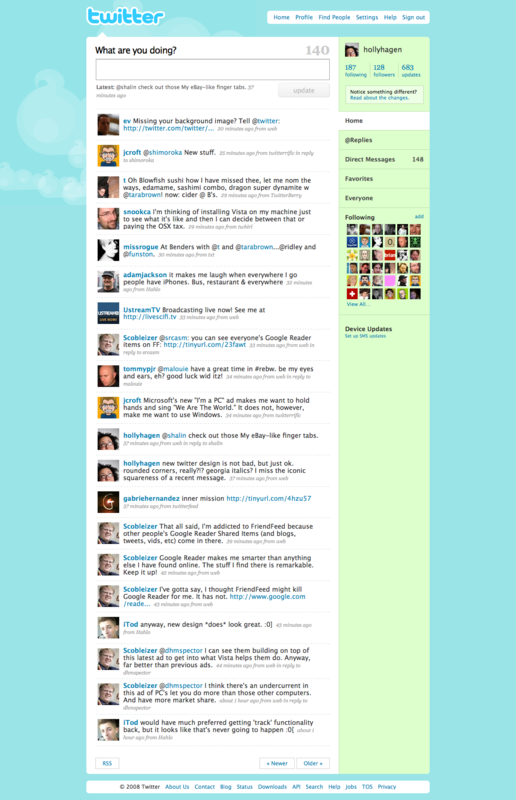 In the new Twitter design, the finger tabs (right) replaced the horizontal ones that used to be above the timeline. I didn’t like the horizontal tabs either and really don’t know what the best solution would be, but those finger tabs just irk me. Maybe it’s because they look like fingers or maybe it’s because they want look like side navigation but act like tabs… something is just confusing about the whole look of them. Pet peeve #3 Georgia Italics… that’s just gross and should never be done. So other than that… it’s good step forward. Congrats, I know how hard it must be to please our large, vocal community. Want to see what everyone else is saying? Check out some of the reviews. I’m laughing because I thought you called them finger tabs because of they’re identical to some iPhone option buttons. I’m surprised how much I miss the square corners. Especially on a single tweet page.